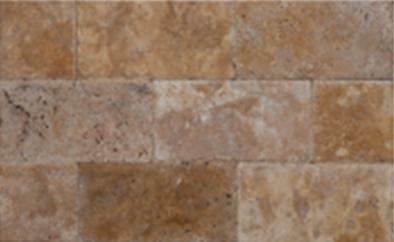 Golden Sienna Tumbled 3cm 6x12 is a rectangular tile made for paving walkways. It is cut from travertine stones along its bedding plane. The pavers come in varying shades of cream, brown, and sienna with grey and off-white swirls. The surfaces are left rough or unfinished for texture. The pits and grooves and unfilled. The edges have a chiseled look which adds to its rustic quality. Golden Sienna Tumbled 3cm 6x12 is sturdy enough to be used for outdoors. It does not show wear and discoloration very much because of its design and colors. The warm colors open up any space it is used on and makes it more welcoming. The surface is textured to keep the foot from slipping on it. Golden Sienna Tumbled 3cm 6x12 is ideal for any outdoor and landscaping projects. It is best used around stone pools and may also be used on garden walkways and patios. The tiles can be used to line plant boxes and stone fences.